This section includes articles on why and how to End High Stakes Testing to return to real learning & allow more time for Lunch, Recess, Art, Music, History and other important subjects. 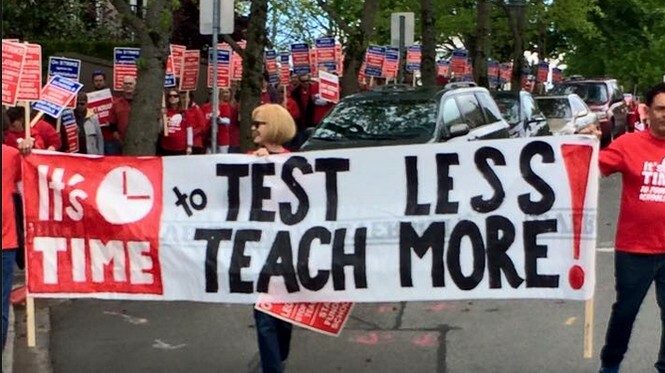 The Seattle School Board Resolution asks to replace the unfair SBAC test with a fairer locally determined alternative and calls on the State Superintendent to "take all actions necessary to allow Seattle Public Schools to move forward with the use of an alternative assessment." I fully support the Seattle School Board Resolution. In fact, I worked with members of the Seattle School Board for the past several months drafting this resolution. I provided the school board with numerous reports detailing the legal framework for the resolution and educational research on the benefits of alternatives to the SBAC test. A summary of the legal framework and educational benefits is provided below. I oppose the SBAC test because it is not fair or age appropriate. In February 2015, I started Opt Out Washington to provide parents with information on why they should opt their kids out of the SBAC test. In December 2015, I read the entire 391-page ESSA which permits use of local alternative assessments. I then met with members of the Seattle School Board to address their questions about how to replace the SBAC test. As Superintendent, I will end the draconian SBAC test as a graduation requirement my first day in office. While other candidates claim they support the Seattle School Board Resolution and oppose to the SBAC test, there are reasons to conclude they will not assist the Seattle School Board in actually getting an alternative assessment. Nor will they end the SBAC test as a graduation requirement. First, let's look at Chris Reykdal's record. While Chris claims to be opposed to the SBAC test as a Graduation Requirement, he voted to bring the SBAC test to our state and make it a graduation requirement in 2013. He has repeatedly voted to keep it a graduation requirement every year since 2013. In fact, Chris is the prime sponsor of House Bill 2214 which not only continues the SBAC test as a graduation requirement but punishes any student who opts out by forcing them to take an additional math course during their senior year that is harder than any previous math course they have ever taken. So if they passed Precalculus during their Junior Year, they would have to pass Calculus during their Senior Year in order to graduation. Chris's bill would force on students in our state the most draconian graduation requirements in the nation! Sadly, none of the other candidates would help Seattle Schools get an alternative assessment either - because none of them support my assertion that Article 3, Section 22 and Article 2, Section 28 of our State Constitution prohibit the legislature from imposing unfunded mandates like the SBAC test on our schools. If I am not elected State Superintendent, students will be forced to endure four more years of the SBAC test as a graduation requirement. During several "forums" I have been the only candidate to point out that Article 3, Section 22 of our State Constitution states: "The superintendent of public instruction shall have supervision over all matters pertaining to public schools." Moreover, Article 2, Section 28 states: "The legislature is prohibited from enacting any special laws in the following cases... #15 Providing for the management of common schools." I contend that "all matters" includes assessments. However, no other candidate has been willing to support this position. Instead, the other candidate for Superintendent will defer to the legislature. Since the legislature will not pass a bill allowing Seattle Schools to use a local assessment, students will continue to be required to pass the unfair SBAC test in order to graduate - resulting in a drastic decrease in the graduation rate and harming tens of thousands of students. As I noted above, it is unlikely that Chris Reykdal would really allow the Seattle School District to use an alternative assessment because he is the chief cheerleader for the SBAC test in Olympia and the prime sponsor of House Bill 2214 - which mandates the SBAC test monopoly. The draconian Common Core SBAC test is so difficult that members of the state legislature cannot answer questions on the 3rd grade SBAC test - much less the 11th grade SBAC test! Chris Reykdal, a candidate for Superintendent of Public Instruction, has said repeatedly at televised forums that House Bill 2214 - a bill of which he was the prime sponsor - "delinks the SBAC test from graduation" and "guarantees the right of students to opt out." House Bill 2214 requires passage of the SBAC 11th Grade test in order to graduate from high school. Students who fail the SBAC 11th Grade Math test - or opt out - (which is about 44,000 students per year or half of all 11th graders) are required to take and pass an additional advanced math course during their Senior year that is harder than any previous math course they have passed before then. So if they passed Precalculus during their Junior Year, they would need to pass Calculus during their Senior Year in order to graduate. No other state is the nation has such draconian graduation requirements. To add insult to injury, Chris Reykdal's bill does not provide school districts with even one extra penny to hire the hundreds of additional math teachers required so the 44,000 Seniors will be able to pass the extra math courses needed to graduate. Instead, teacher pay is so low that half the school districts already do not have enough qualified math instructors. To make matters even worse, if a student opts out of the 11th grade SBAC test, they are punished with a score of Zero that goes on their permanent record AND they are required to take additional courses in both Math and English during their Senior Year in order to graduate - even if they had already completed all of the Math and English course requirements! Reykdal has the audacity to call this protecting the rights of students to opt out! Here are the high school graduation requirements beginning with Line 33, Page 4: "Beginning with the graduating class of 2017, a student must earn... a score of level 3 or level 4 on the high school (SBAC) English and mathematics assessment." Page 5, Line 12 requires students to take the SBAC test at least once: "A student... must have taken, at least once, the high school English and mathematics assessments." On Page 6, Line 20, Chris allows students who opt out of the draconian SBAC test to take "other options." But the other options are the SAT test or the ACT test. Even then, students must still achieve a score equivalent to the SBAC test or it is off to the salt mines! On Page 8, Line 12 Chris forces students who fail or opt out of the SBAC test to take and pass "rigorous" courses harder than any previous course they have ever passed in order to graduate from high school: "A course shall be deemed rigorous if it is at a higher course level than the student's most recent coursework in the content area in which the student received a passing grade of C or higher." At the end of a Candidate Forum in Bellingham, when I quoted the above sections of House Bill 2214 and asked Chris Reykdal why he insists on subjecting our kids to a graduation test that he himself cannot pass - and why he wants to subject our kids to the most draconian graduation requirements in the nation - even though our kids are subjected to the highest class sizes in the nation and often do not even have a qualified math teacher - Chris replied that House Bill 2214 did not actually say what I said it did (even though I quoted from the Bill). It is amazing how Chris is willing to ignore and disavow the language in his own bill in order to win an election. Chris has a serious problem of denying the facts. This is why it does not really matter what Chris says about allowing the Seattle School District to use an alternative assessment or about opposing the SBAC test as a graduation requirement. If Chris is elected, what we will actually see is Chris coming up with some lame excuse to continue the SBAC test and imposing the most draconian graduation requirements in the nation on our kids. Throughout this report, we will quote several significant changes in law as they related to the SBAC test (in bold italics with page numbers at the beginning of each section). Page 13: SEC. 1001. STATEMENT OF PURPOSE. The fact that the SBAC test is not fair and actually increases the achievement gap by forcing students who do not have access to a computer at home to take a computer test renders the SBAC test contrary to the purpose of the ESSA. On page 16 the “special rule” specifies that states cannot grant local education agencies less funding in subsequent years than states did in previous years. The purpose of this rule is to prevent state or federal agencies from threatening local school districts with loss of funding. Page 5: EFFECTIVE DATES. Except as otherwise provided in this Act, or an amendment made by this Act, this Act, and the amendments made by this Act, shall be effective upon the date of enactment of this Act. An exception is Section 1111 of the Elementary and Secondary Education Act of 1965 which defines State Improvement Plans Section 1111. Among the requirements of Section 1111 are that "The State shall ensure that the indicators described in those provisions are valid and reliable... REQUIREMENTS- Such assessments shall--be used for purposes for which such assessments are valid and reliable...". Since the SBAC test is not reliable or valid, OSPI has failed in its legal obligation under Section 1111 to provide local school districts with a reliable and valid assessment. The ESSA does not specifically state what a local school district should do if a State fails to provide the school district with a test that is fair, reliable and valid. But additional language placed in the new ESSA does provide some guidance. (i) STANDARDS REVIEW OR APPROVAL.—A State shall not be required to submit any standards developed under this subsection to the Secretary for review or approval. (ii) FEDERAL CONTROL.—The Secretary shall not have the authority to mandate, direct, control, coerce, or exercise any direction or supervision over any of the challenging State academic standards adopted or implemented by a State. Page 24 clearly describes the requirements of academic assessments. Because the SBAC test does not provide accurate information about students achieving at grade level, and is not reliable or valid, the SBAC test is not consistent with the requirements of the ESSA. We will explain in further detail below why the SBAC test does not provide information about whether or not a student is "at grade level" and why the SBAC test is not valid or reliable. "Involve multiple up-to-date measures of student academic achievement, including measures that assess higher-order thinking skills and understanding, which may include measures of student academic growth and may be partially delivered in the form of portfolios, projects, or extended performance tasks." Ironically, while the SBAC test is not a valid or reliable method of determining whether a student is performing at grade level, school districts already employ a reliable and valid assessment system that does indicate whether a student is performing at grade level. That system is called teacher grades - as indicated by the students cumulative grade point average - which includes multiple up to date measures of student academic achievement and may include portfolios, projects and the extended performance task of each student completing their assignments over a 180 day school year. Thus, in the present case, where the State through OSPI has failed to provide school districts with a valid and reliable state assessment system that determines whether students are performing at grade level, school districts can and should rely on teacher grades and report teacher grades to the state as a more reliable and valid assessment system which does actually determine in a timely manner whether students are performing at grade level. The ESSA refers to local school districts as "local educational agencies" and refers to assessments chosen by local school districts as a "locally selected assessment." The new ESSA allows local school districts to choose their own assessment systems. Nothing in this paragraph shall be construed to prohibit a local educational agency in lieu of the State-designed academic assessment under subclause (I)(bb) and subclause (II)(cc) of subparagraph (B)(v), if the local educational agency selects a nationally-recognized high school academic assessment that has been approved for use by the State as described in clause (iii) or (iv) of this subparagraph... If a local educational agency chooses to submit a nationally- recognized high school academic assessment to the State educational agency, subject to the approval process described in subclause (I) and subclause (II) of clause (iii) to determine if such assessment fulfills the requirements of clause (v), the State educational agency may approve the use of such assessment consistent with clause (i)... Upon such approval, the State educational agency shall approve the use of such assessment in any other local educational agency in the State that subsequently requests to use such assessment without repeating the process described in subclauses (I) and (II) of clause (iii). The limitation is that the local school district must use a "nationally-recognized high school academic assessment that has been approved for use by the State." There is no question that teacher grades are a nationally recognized academic assessment system because teacher grades have been used in nearly every state for more than 100 years to determine whether students are performing at grade level. Teacher grades are also incorporated into Washington state law because teacher grades are used to determine whether a student can be given course credits towards high school graduation and advancement from one grade to the next. The locally determined assessment system must be comparable in validity and reliability to the state designed assessment system. There is abundant research confirming that teacher grades are much more reliable than the SBAC test and much more accurate in determining whether a student is performing at grade level. We will describe this research after finishing this summary of the requirements of the new ESSA. The new ESSA also has sections on Parental Notification and Parental Rights. If a school district decides to use an alternate assessment system, the ESSA requires that the school district notify parents of this decision and why the alternative system may be superior to the state assessment system. Page 31: PARENTAL NOTIFICATION .—A local educational agency shall notify the parents of high school students served by the local educational agency of its request to the State educational agency for approval to administer a locally-selected assessment; and upon approval, and at the beginning of each subsequent school year during which the locally selected assessment will be administered, that the local educational agency will be administering a different assessment than the State-designed assessments. Local school districts can also establish local rules for allowing parents to opt their child out of the state assessment system. Page 32: PARENT RIGHTS — Nothing in this paragraph shall be construed as preempting a State or local law regarding the decision of a parent to not have the parent’s child participate in the academic assessments under this paragraph. It therefore would be in keeping with the new ESSA for a school district to use teacher grades as an alternate assessment system from SBAC. However, because the new ESSA requires that the alternate assessment system be approved by the state, a safer course of action would be for local school districts to continue to offer the SBAC test but at the same time to send all parents in the school district a letter explaining why teacher grades are a fairer, more valid and more reliable assessment system and to notify parents that they have a specific right under the new ESSA to opt their child out of the SBAC test. The letter to parents should also let parents know that for students who are opted out of the SBAC test, the school district will submit teacher grades to OSPI instead of SBAC test scores in order to comply with the new ESSA. While each state must provide at least one assessment system that is valid and reliable, the new ESSA clearly provides that states may use more than one assessment system and may use any indicators chosen by the state. Page 35: For all public schools in the State, not less than one indicator of school quality or student success that— allows for meaningful differentiation in school performance; is valid, reliable, comparable, and state-wide (with the same indicator or indicators used for each grade span... , and may include one or more of the measures... student engagement; educator engagement; student access to and completion of advanced coursework; postsecondary readiness; school climate and safety; and any other indicator the State chooses that meets the requirements of this clause. Page 36: ANNUAL MEASUREMENT OF ACHIEVEMENT .—(i) Annually measure the achievement of not less than 95 percent of all students, and 95 percent of all students in each subgroup of students, who are enrolled in public schools on the assessments described under subsection. But students must be measured with an assessment system that is fair, reliable, valid and provides information about whether or not a student is performing at grade level. Since the SBAC test does none of these things, while teacher grades do all of these things, the best way a local school district can comply with the 95% requirement is to submit teacher grades to the state for at least 95% of its students. Above and below are two of many places in the new ESSA where control over schools is taken away from the federal government and put back in the hands of states and local school districts. Page 42 DEFINING TERMS .— the Secretary shall not, through regulation or as a condition of approval of the State plan or revisions or amendments to the State plan, promulgate a definition of any term used in this part, or otherwise prescribe any specification for any such term, that is inconsistent with or outside the scope of this part or is in violation of paragraph (1). The state and by extension school districts in each state are required to participate in the National Assessment of Educational Progress (NAEP) which is a fair valid and reliable assessment system for grades 4 and 8. Since teacher grades closely match NAEP passing scores while the SBAC passing scores are radically different from NAEP passing scores, this is one more reason for local school districts to use teacher grades rather than the SBAC test. The ESSA also requires the state to provide the least restrictive and burdensome regulations on local school districts. Certainly teacher grades are the least restrictive and burdensome while the SBAC test is the most restrictive and burdensome. The new ESSA clearly requires the state to insure that the state assessment system is a valid assessment process. Sadly, the state of Washington has clearly failed to comply with federal law because, as we describe in detail below, the SBAC test lacks validity. On page 50, the new ESSA clearly gives its approval of report cards - which consist of teacher grades - to assess the academic performance of students. Page 50 PREEXISTING REPORT CARDS .—A State educational agency or local educational agency may use public report cards on the performance of students, schools, local educational agencies, or the State, that were in effect prior to the date of enactment of the Every Student Succeeds Act for the purpose of this subsection, so long as any such report card is modified, as may be needed, to contain the information required by this subsection, and protects the privacy of individual students. Page 51 makes it clear that the federal government does not require high stakes tests for student promotion from one grade to the next or for graduation from high school. The vast majority of all states have abandoned the use of a high stakes test for graduation purposes. Currently only 13 states require passing a high stakes test in order to graduate. In just the past year, Arizona, Georgia, Texas, South Carolina, California and Alaskahave passed laws to allow students who failed high stakes tests to get their diplomas anyway.The difference between a high school graduate and a high school dropout is a 37 percent increase in weekly earnings on average.So why does the Washington state legislature require passing a high stakes test in order to graduate? Page 51 Nothing in this part shall be construed to prescribe the use of the academic assessments described in this part for student promotion or graduation purposes. One reason parents might want their students to take the SBAC test is that passing the SBAC English test might be required to graduate from high school (even though it has never been required before). In addition, House Bill 2214 should it pass the legislature in 2016 has an emergency clause that might also require passage of the SBAC math test in order to graduate from high school. These two tests are so difficult that it is unlikely that the majority of state legislators could pass these tests. There is a legal question as to whether the state legislature has the authority to force students to pass tests that are not reliable, are not valid, are not fair to low income and minority students, do not comply with the ESSA and that the majority of state legislators could not pass. At the very least, local school boards should ask the Superintendent of Public Instruction for a waiver of this rule. The current Superintendent has stated that he is opposed to using any high stakes test as a graduation requirement. ARTICLE III, SECTION 22 SUPERINTENDENT OF PUBLIC INSTRUCTION, DUTIES AND SALARY.The superintendent of public instruction shall have supervision over all matters pertaining to public schools, and shall perform such specific duties as may be prescribed by law. The question of the legislature making unreasonable and unfair demands on students in order to graduate should also consider the fact that the legislature has refused to fully fund our public schools so that struggling students could get the help they need to overcome all of the hurdles placed in their path by the state legislature. At the very least, any testing provisions required for graduation should be suspended until such time that the state legislature complies with their "paramount duty" to fully fund our public schools for a period of 13 years. This will insure that struggling students had a fair chance to get the help they need to succeed in school and meet the graduation requirements imposed by the state legislature. In short, local school districts should petition the Superintendent of Public Instruction to waive passage of the SBAC test as a graduation requirement. If the Superintendent refuses, local school districts should take the Superintendent and state legislature to court for their numerous violations of the Washington State Constitution and ESSA to protect the rights of students to a fair education. Page 56 of the new ESSA further clarifies the rights of parents to be fully notified about assessments and their right to opt their child out of state assessments. (A) IN GENERAL .—At the beginning of each school year, a local educational agency that receives funds under this part shall notify the parents of each student attending any school receiving funds under this part that the parents may request, and the local educational agency will provide the parents on request (and in a timely manner), information regarding any State or local educational agency policy regarding student participation in any assessments mandated by section 1111(b)(2) and by the State or local educational agency, which shall include a policy, procedure, or parental right to opt the child out of such assessment. (B) ADDITIONAL INFORMATION .— each local educational agency that receives funds under this part shall make widely available through public means (including by posting in a clear and easily accessible manner on the local educational agency’s website and, where practicable, on the website of each school served by the local educational agency) for each grade served by the local educational agency, information on each assessment required by the State to comply with section 1111. Page 70 of the new ESSA calls for local school districts to allow the "informed participation of parents and family members." This allows local school districts to inform parents about their choices and then let parents choose which assessment system(s) the parents decide is in the best interest of their child. Page 318 makes it clear that states may revise standards in whatever way they want. Page 318 STATE CONTROL OVER STANDARDS. Nothing in this Act shall be construed to prohibit a State from withdrawing from the Common Core State Standards or from otherwise revising their standards. Page 321 makes it clear that states and local school districts retain the ultimate rights and responsibilities for determining assessments for elementary and secondary schools. Local school districts therefore not only have the right to control assessments but a responsibility to insure that whatever assessments are chosen will be fair, reliable, valid and accurate predictors of whether or not a student is at grade level. It is the sense of the Congress that States and local educational agencies retain the rights and responsibilities of determining educational curriculum, programs of instruction, and assessments for elementary and secondary education. Page 331 states that local school districts have a responsibility to make accommodations for homeless students. This is particularly important for school districts in Washington state as a 2016 report by OSPI indicated that Washington state now has more than 35,000 homeless children. It is grossly irresponsible to force homeless children to take an unfair, unreliable high stakes test when such students are already faced with the challenge of doing their homework while living on the streets, under bridges or in the back of a car. Page 331 HOUSING ASSISTANCE (for homeless students) .—Each State educational agency and local educational agency that receives assistance under this subtitle shall coordinate with State and local housing agencies responsible for developing the comprehensive housing affordability strategy described in section 105 of the Cranston-Gonzalez National Affordable Housing Act (42 U.S.C. 12705) to minimize educational disruption for children and youths who become homeless. Finally, Page 337 clarifies that neither teachers, parents or students lose their constitutional right to free speech simply because they happen to be in a school. Page 337 Retention of Constitutional Rights... 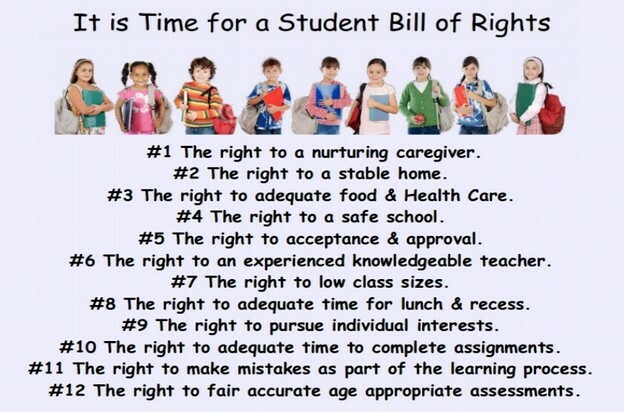 It is the sense of Congress that a student, teacher, school administrator, or other school employee of an elementary school or secondary school retains the individual’s rights under the First Amendment to the Constitution of the United States during the school day or while on the grounds of an elementary school or secondary school. As noted above, the new ESSA requires that an assessment system have four essential characteristics. These are fairness, reliability, validity and the ability to assess whether or not any given student is achieving "at grade level." We will next show that the SBAC test does not meet any of these four essential characteristics. The first mandatory characteristic is fairness. Fairness means that all students have an equal opportunity to pass the test. Here we will provide four examples of how teacher grades are much fairer than the SBAC test. #1.1 The SBAC test is administered entirely online whereas the Iowa Assessments include paper and pencil assessments as an option. Because the SBAC test is administered entirely online, the SBAC test requires students as young as 3rd grade to have typing, keyboarding and screen navigation skills. Recent research indicates that online tests discriminate against low income and minority students. Half of all low income students lack access to a computer at home while only 6% of middle to high income students lack access to a computer at home. As a consequence, low income students do not do as well as high income students on online tests. While the SBAC test does not have a paper and pencil version, the other Common Core test called PARCC has both a paper version and an online version. Education Week reported that students who took the PARCC test online got much lower scores than those who took the test with paper and pencil.“Students who took the 2014-15 PARCC exams via computer tended to score lower than those who took the exams with paper and pencil-a revelation that prompts questions about the validity of the test results and poses potentially big problems for state and district leaders." The Illinois State Board of Education found that, across all grades, 50% of students scored proficient of the paper-based PARCC exam compared to only 32% of students who took the exam online. This research indicates that because of a lack of computers in their homes, low income and minority students score about 10% to 20% lower on an online computer test than they score on an identical test that uses a paper and pencil format. 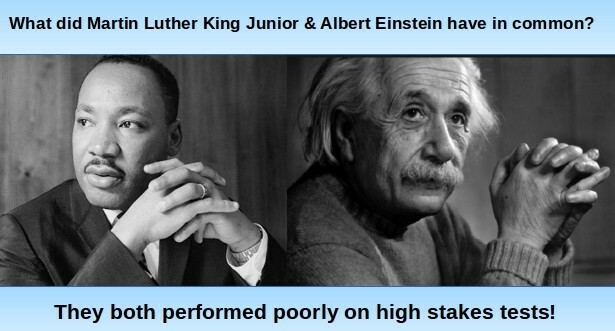 A similar result occurred with two new Common Core High School Equivalency tests. The Pearson GED test is an online only test that only 30% of students can pass while the HiSET offers a paper and pencil version of their test that 60% of students can pass. Perhaps this is why, when low income struggling students are offered a choice between an online high stakes test and a paper and pencil high stakes test, over 80% choose the paper and pencil test. For example, New Hampshire offers the HiSET in both paper and online versions. In 2015, 85% of students chose to take the paper version of the HiSET test. Therefore the fact that the SBAC test is only available in an online version is unfair to low income students who lack experience with computers in their home. #1.2 The SBAC Test ignores high class sizes and incorrectly assumes that all students have had a fair opportunity to learn the skills covered on the test. The SBAC test assumes that our schools are fully funded and that every student has a fully qualified teacher and small class sizes. Unfortunately, this is not currently the case in Washington state. Despite having one of the top ten economies in the nation, Washington state is 47th in the nation in school funding as a percent of income. As a result, Washington state has among the highest class sizes in the nation. High class sizes mean not only that struggling students do not get the help they need, but that teachers are also placed under a great deal of stress. As just one example, the SBAC 11th grade math test includes Algebra II problems. My daughter's Algebra II teacher had 5 sections of Algebra II students with each class having about 35 students. The instructor was further required to comply with the Common Core math schedule. Because students kept asking questions, by the third week of the class, the instructor was over one week behind the Common Core schedule. He told the students they were no longer allowed to ask questions. After two more weeks in which the classes fell further behind, the instructor had a nervous breakdown and took the next 4 months off. Because the state legislature refuses to fully fund public schools, the school district was unable to find a replacement Algebra II instructor. The series of unqualified instructors who babysat the classes for the next four months knew nothing about Algebra II and were unable to answer the students questions. The original instructor returned in February 2016 but it is clear that these students will not have a fair chance to pass the SBAC math test because they did not receive instruction on the topics that will be on the test. This is not the fault of the math teacher or the school district or the school board. It is the fault of the state legislature which has utterly failed to fully fund our public schools in the manner required by our state constitution. But it will be struggling students who will be unfairly held accountable for the failure of the legislature to fund our schools. #1.3 The SBAC Test incorrectly assumes that students have had several years to learn the Common Core standards. Common Core standards begin in Kindergarten and assume a building block approach that carries through high school. This means that our high school students are being forced to learn and be tested on standards that they were never prepared for in either middle school or elementary school. #1.4 The SBAC Test incorrectly assumes that the Common Core standards and Common Core Test questions are age appropriate. Their statement reads in part: "We have grave concerns about the core standards for young children…. The proposed standards conflict with research in cognitive science, neuroscience, child development, and early childhood education about how young children learn, what they need to learn, and how best to teach them…. 1. The K-3 standards will lead to long hours of direct instruction. This kind of “drill and grill” teaching will push active, play-based learning out of many kindergartens. 4. There is little evidence that standards for young children lead to later success. The research is inconclusive; many countries with top-performing high-school students provide rich play-based, nonacademic experiences—not standardized instruction—until age six or seven. Our first task as a society is to protect our children. The imposition of these standards endangers them. The Core Standards will cause suffering, not learning, for many, many young children. The National Association for the Education of Young Children is the foremost professional organization for early education in the U.S. Yet it had no role in the creation of the K-3 Core Standards. The Joint Statement opposing the standards was signed by three past presidents of the NAEYC—David Elkind, Ellen Galinsky, and Lilian Katz—and by Marcy Guddemi, the executive director of the Gesell Institute of Human Development; Dr. Alvin Rosenfeld of Harvard Medical School; Dorothy and Jerome Singer of the Yale University Child Study Center; Professor Howard Gardner of the Harvard Graduate School of Education; and many others. If the problems with the SBAC test were merely limited to the fact that it is not a fair, reliable, valid or accurate measure of whether students are at grade level, one might conclude that the test should be tolerated. But the SBAC test is such a deeply flawed test that it harms students by turning our schools into a toxic test prep pressure cooker where all students learn is to hate school rather than a joyful productive learning environment. By forcing students to attempt tasks that the student is not developmentally ready to perform and then labeling students as failures for being unable to perform these unreasonable tasks, the SBAC test is a form of child abuse. As a leader of Opt Out Washington, I have conducted meetings across the state on how and why parents can and should opt their kids out of the unfair SBAC Common Core test. At these meetings, parents often bring their own stories of how the SBAC test has harmed their kids. At a recent Opt Out meeting, a mom spoke tearfully about her Third Grade son who became depressed and attempted to kill himself after failing the Third Grade SBAC Common Core math test. Since the introduction of developmentally inappropriate Common Core standards and unfair Common Core high stakes tests, there has been a 40 percent increase in the suicide rate of elementary school students in the US and a 20 percent increase in the suicide rate of high school students. 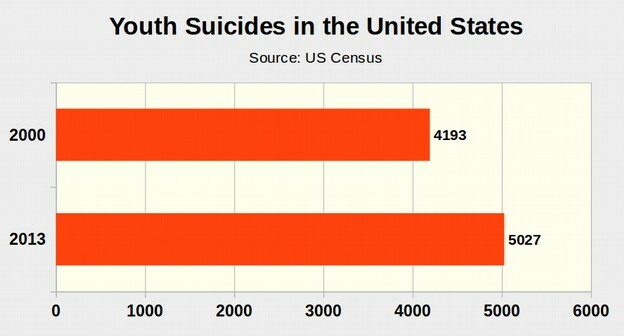 Specifically, according to the US Census, in 2000, 205 elementary school children ages 5 to 14 committed suicide. In 2013, 286 children committed suicide for an increase of 40%. In 2000, 3,988 young adults ages 15 to 24 committed suicide. In 2013, 4,741 young adults committed suicide for an increase of 19%. In total, for ages 5 through 24, in 2000, before No Child Left Behind, 4193 kids committed suicide. In 2013, the total number of kids who killed themselves was 5,027 kids for an increase of 834 needless deaths per year or a 20% increase. The paramount duty of a school board is to protect young children from this kind of systematic and permanent harm. The challenge faced by the school board is to find a way to comply with federal law while protecting children from harm to the maximum extent possible. The source of the problem is not federal law. 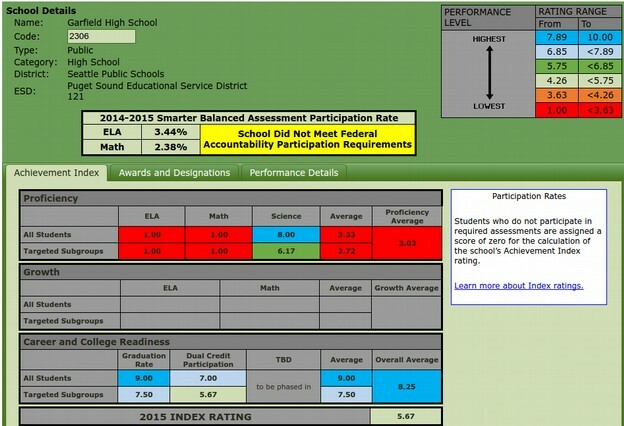 It is that the Washington State Superintendent of Public Instruction has failed to comply with federal law by failing to provide the school district with an assessment system that is fair, reliable, valid and accurate. The good news is that the school district already has an assessment system that is fair, reliable, valid, accurate and nationally recognized in the form of teacher grades. In the final section of this report, we will describe a process for transitioning from the unfair and likely illegal SBAC assessment system to meeting federal assessment reporting requirements by using teacher grades instead of the SBAC test. The SBAC test harms low income and minority students by labeling nearly 75% of them - even students performing at grade level - as failures. These low income third graders, many of whom already face significant challenges in their home life, tend to internalize the failure to pass the SBAC test. They blame themselves for failing the test. They get depressed and give up on school and give up on life - falsely concluding that they are stupid because they cannot figure out how many boxes of paper clips there are and how many paper clips are in each box. Washington State 8th graders are among the highest scoring 8th graders in the nation and in the world on national and international tests. Yet the unfair and inaccurate SBAC Math Test had the audacity to unfairly label 54% of them as failures! 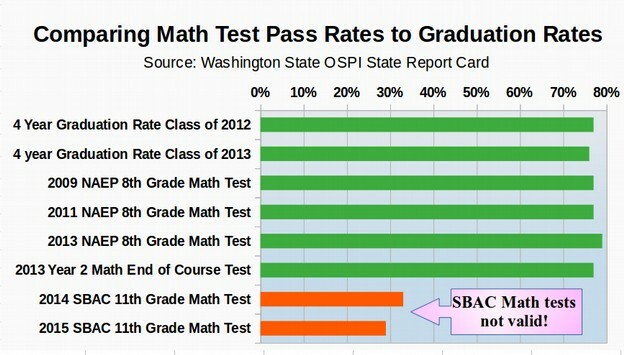 * Over 60% of 11th graders opted out of the SBAC Math in Washington State. Thus, the number listed is "met standard excluding no scores." Keep in mind that these same Washington students scored second highest in the nation in 2009 on the NAEP 8th Grade Math Test. 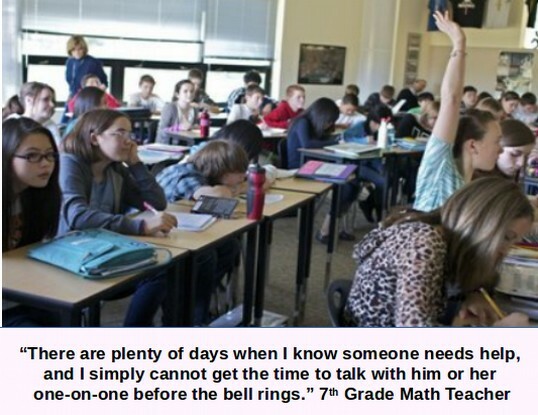 * Over 80% of 11th graders opted out of the SBAC Math Test in the Seattle School District. Thus, the number listed is "met standard excluding no scores." Keep in mind that the Seattle School District is above the Washington State average, far above the national average and one of the highest scoring urban school districts in the nation and in the world. Based on the results from Kentucky and New York, there will not be a significant improvement in SBAC proficiency scores over time. However, if the Seattle School Board replaced the SBAC test with the Iowa Assessment, the proficiency scores would raise dramatically for three reasons. First, the Iowa Assessment is set for a Proficient Cut Score of 60% based on a national sample. Because the State of Washington is about 5% above the national average, this means that 65% of Washington students would be rated as Proficient with the Iowa Assessment. Because Seattle students are about 10% above the Washington State average, about 75% of Seattle students would be rated as Proficient using the Iowa Assessment. This is still slightly less than the 78% of Seattle students rated as Proficient using the NAEP test. But it is a very accurate representation of the percent of students who are "at grade level" which is the federal standard under the new ESSA. This close alignment to the federal standard is what makes the Iowa Assessment a fair, accurate, reliable and valid assessment. Equally important, all questions have been screen by child development specialists to make sure they are age appropriate. No child will be asked a question that is age inappropriate. 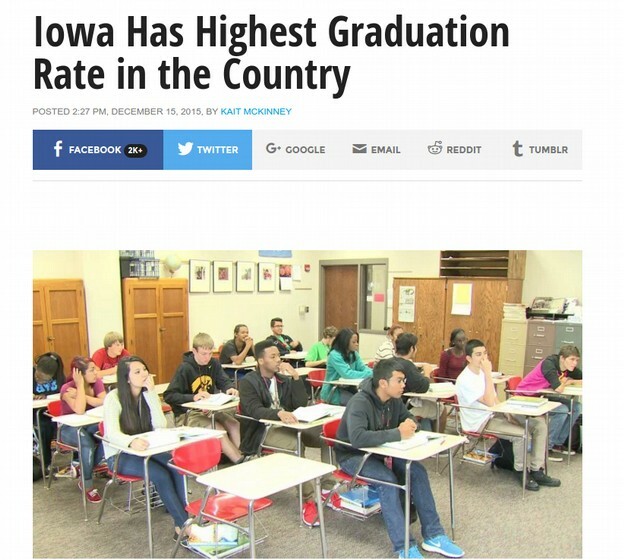 The fairness and age appropriateness of test questions is likely one reason that the State of Iowa has the highest graduation rate in the nation. It is because their students are not traumatized by being subjected to unfair and age inappropriate high stakes test questions. 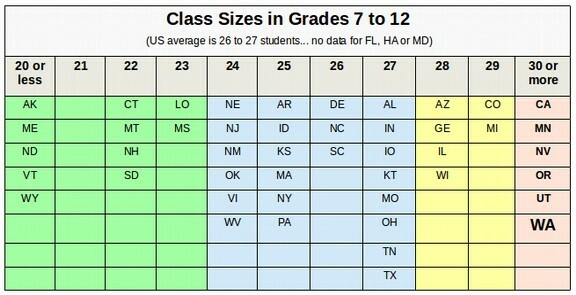 Iowa also has much smaller class sizes than Washington. Validity refers to whether a test measures what it claims that it measures. Like the SAT test, the SBAC test promoters incorrectly claim that the SBAC test can assess whether students are "college ready." In fact, there is no evidence that the SBAC test - or any bubble test -can reliably determine which students are career and college ready. Instead, the largest study ever conducted on the ability of bubble tests to determine college readiness - involving more than 81,000 students in California - found that the SAT test was no more able to determine college readiness than a coin toss! Instead, the most reliable predictor of college readiness was a student's high school Grade Point Average (GPA) – or the average of the combined grades from 24 teachers who worked with the student during their four years of high school. A study by the Harvard Graduate School of Education also found that high school grades of students in New York were much more accurate in predicting college grades that scores on high stakes tests. Another 2014 study found that students who did not submit high stakes test scores performed as well in college as students who did submit high stakes test scores. Put in plain English, high stakes bubble tests like the SBAC test are not as reliable or as valid as grades from teachers. Those who claim that the SBAC test can predict college readiness are not telling the truth. If the goal of an assessment system is to determine career and college readiness, then Teacher Grades are the most valid assessment system. However, the Iowa Assessment does include a "college readiness" scale that is matched to the ACT College Readiness test. Reliability refers to how repeatable the test is and how well the test questions match other test questions and other performance measures. The SBAC test is radically different from any other previous assessment of student achievement. The SBAC test is a variable item test that gives different questions to different students even in the same class. There are more than 40,000 questions just in the math portion of the SBAC test - making it impossible to tell which students get which questions. Furthermore, because the SBAC test has been developed in secrecy, no school board members, teachers or parents are able to independently review the reliability, validity or fairness of any particular test questions or any particular test. This utter lack of reliability stands in sharp contrast to the National Assessment of Educational Progress (NAEP) that has published their test questions along with the actual percentage of students that have correctly answered each test question. 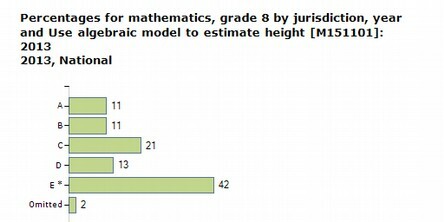 For example, the following table shows the actual percentage of students in the United States who got the correct answer on an algebra question about determining height from a formula was 42%. This question was therefore rated as a NAEP "medium" difficulty math question. The lack of reliability of the SBAC test also stands in sharp contrast to the Iowa Assessment which has shown a strong correlation to the NAEP test and to student achievement. The SBAC test ignores the meanings of the terms Basic, Proficient and "At Grade Level." Since the term "at grade level" is specifically used in the new ESSA, the failure of the SBAC test to relate student achievement to grade level is perhaps its most important shortcoming. Historically, students were graded on a Bell Shaped Curve with the letters A, B, C, D and F. These grades were changed to number grades such as 4.0, 3.0, 2.0 and 1.0. The term "as grade level" means that a student has achieved a letter grade of A, B, or C. While D might be a passing grade, it indicates that the student is struggling and performing below grade level. But C work is at grade level and B work is above grade level. While all standardized bubble tests are notorious for discriminating against low income and minority students, the most reliable, valid, transparent and highly researched standardized test is the National Assessment of Student Progress (NAEP) which has been administered and researched for more than 30 years. Most people are familiar with the traditional letter grading system of A, B, C, D and F shown on the table above. Unfortunately, the SBAC test and NAEP tests use different grading systems. It is therefore important to understand how these various grading and ranking systems are related or not related. You can see from the above table that NAEP Hard Math questions can be answered by A and B students while NAEP Medium Math questions can be answered by C students. 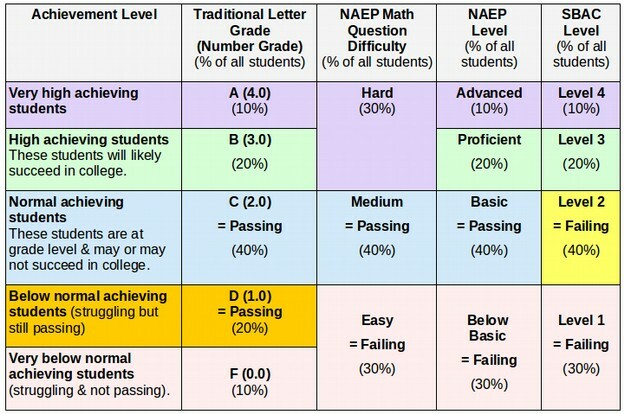 Also, the NAEP ranking system made a controversial change to the traditional grading system. NAEP changed a D grade which has historically been a passing grade into a failing grade. This meant that to pass the NAEP test, with a score of Basic, a student needed to be “at grade level” with an average traditional grade of C. This change tripled the percent of students who were labeled as failures from 10% to 30% - without any change in the actual performance of the students. The SBAC test went even further than the NAEP test. SBAC test designers had the audacity to even declare students who are at grade level and passing with a C grade as failures (SBAC level 2). This increased the percent of students who were labeled as failures from 30% to 70%. 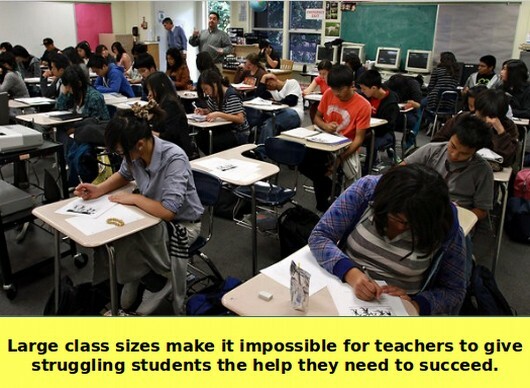 This is the reason the SBAC test fails two out of three students who take the test – it is designed to fail even students who are at grade level! This was done by manipulating the cut scores of the test. 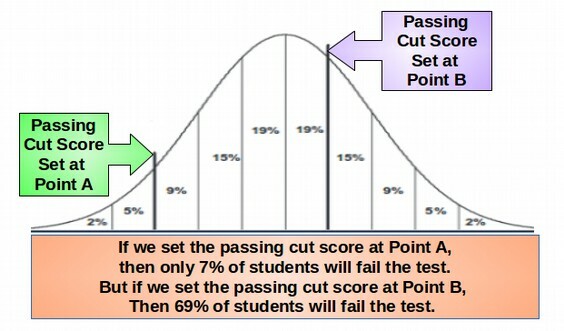 In reality, student performance typically occurs along a continuous bell shaped curve. Traditionally, we have set cut scores so that about 10% of these students would get an A, 20% would get a B, 40% would get a C, 20% would get a D and about 10% would get an F and fail the test or fail the course. According to OSPI, the 2015 actual SBAC math test results for spring 2015 failed about 70 % of all students and those who failed were disproportionately students of color, English Language Learners, students with special needs and students living in poverty. The four year high school graduation rate for the Seattle School District is about 76%. Because passing Teacher Grades is required to graduate, this high school graduation is a close proxy for Teacher Grades of the percentage of students who are at grade level. Thus, about 76% of all Seattle students have historically been "at grade level." On the 2014 Washington State 8th grade End of Course (EOC) math exam, 84% of Washington state students passed, while in the Seattle School District 87% passed the Math EOC exam. This indicates that the Seattle School District is at or above the Washington State percentage for students who are "at grade level" in the 8th grade. By comparison, in the Tacoma school district, only 41% of 8th Graders passed the Math EOC exam. In 2015, 74% of Washington 8th grade students scored at or above Basic (or at Grade Level) on the National Assessment of Student Progress Math Test. 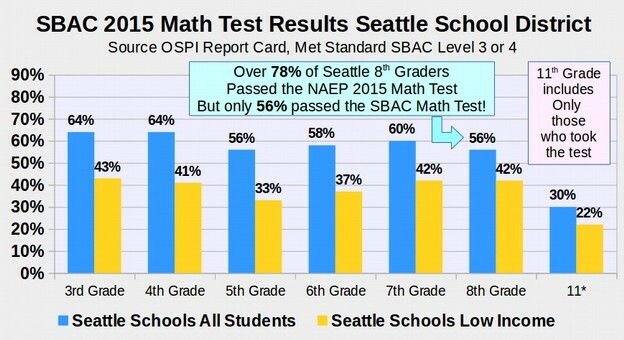 Given the excellent performance of Seattle students being above the state average on the 8th grade EOC math exam, it is likely that more than 78% of Seattle 8th grade students scored at or above Basic (or at Grade Level) on the NAEP 8th grade math test. This was well above the national average. Nationally, only 68%of 8th Grade Students scored at or above Basic (or at grade level) on the 8th grade NAEP math test. By contrast, in the Los Angeles School District, only 52% of 8th Graders scored at or above Basic in the 8th grade math test. In the Chicago School District, only 62% scored at or above Basic. In the New York City School District, 62% scored at or above Basic. There are two important facts about the above chart. First, a much higher percentage of Seattle students are at grade level than in other urban cities across the US. 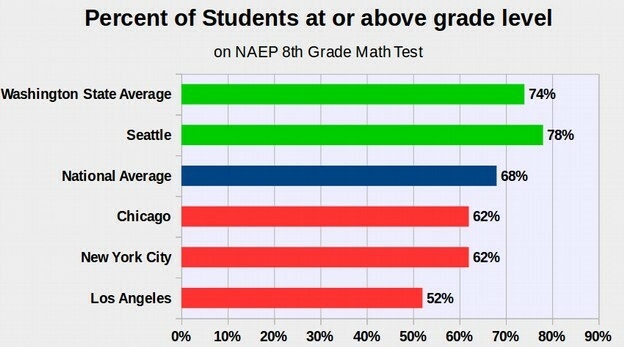 Second, the percentage of students who are at grade level in the Seattle School District as determined by the NAEP 8th grade math test (78%) matches the percentage of students who graduate from high school in the Seattle School District which is a proxy for Teacher Grades (78%). This is strong evidence of the accuracy of teacher grades in the Seattle School District in estimating the percentage of students who are at grade level. Alternately, it is strong evidence of the accuracy of the NAEP 8th grade math test for determining the percentage of students who are at grade level. Put in plain English, both the Iowa Assessment and the NAEP 8th grade math test are fair, reliable, valid and accurate measures of student progress. This is not to say that having 78% of students at grade level or 78% of students graduating is acceptable. If the state legislature would fully fund public schools, class sizes could be smaller and more struggling students could get the help they need to succeed in school and then a higher percentage of students would be at grade level and graduate. This is merely to say that the Iowa Assessment and the NAEP 8th grade math test are fair, reliable, valid and accurate assessment systems. 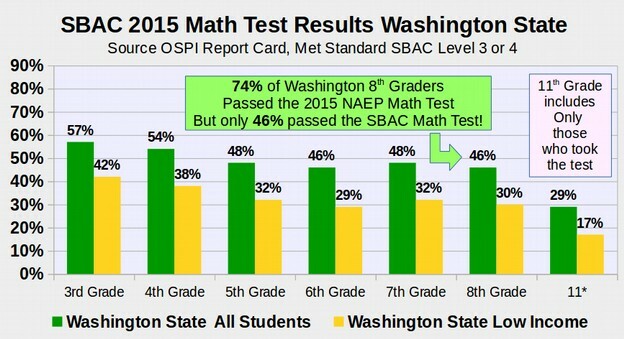 By sharp contrast, only 46% of Washington 8th graders "met standard" on the SBAC math test by scoring at a level 3 or 4. Only 56% of Seattle students met standard by scoring a Level 3 or 4. In the Tacoma School District, only 38% of 8th grade students scored a Level 3 or 4 on the SBAC 8th grade math test. While both the Iowa Assessment and the NAEP test estimate that about 78% of Seattle School District students are at grade level, the SBAC test falsely claims that only 56% of Seattle School District students are at grade level. This confirms that the "standard" being measured by SBAC is not the same as the "at grade level" standard being measured by the NAEP math test and being measured by the Iowa Assessment. This is why the SBAC test is not a fair, reliable, valid or accurate assessment. The failure of the SBAC test to accurately measure the actual ability level of Seattle School District students can only partially be attributed to the misuse of the term "proficient." The fact that SBAC is a computer only test and that it gives different test questions to different students are also likely contributing factors to the unfair nature of the SBAC test. The following chart shows that the 11th grade SBAC math test is even less accurate in determining the percent of students at grade level than the 8th grade SBAC test. There is no question that the SBAC test does not comply with the new ESSA law. The fact that the Washington State Superintendent of Public Instruction has violated federal law by failing to provide school districts with a test that is fair, reliable, valid and accurate does not permit any school board to also violate federal law. The question is what a school board should do instead? Proposed Option: Continue to administer the SBAC Test for one more year but providing parents with accurate information on the drawbacks of the SBAC test and offering parents the opportunity to opt out of the SBAC Test. Then apply to OSPI for a Local Alternative to use the Iowa Assessments instead of the SBAC Test beginning with the 2016 2017 school year. 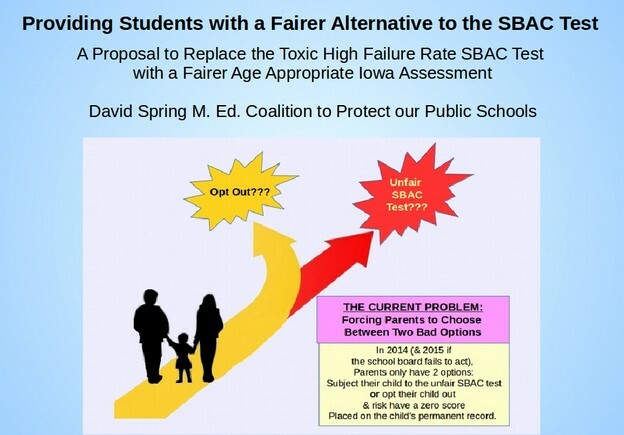 This course of action is somewhat repulsive because it continues to inflict a harmful SBAC test on students for one more year while the school district requests permission from OSPI to use the Iowa Assessment instead of the SBAC test. This action will not satisfy parents and teachers who want the SBAC test to end immediately. But it would give the school board an opportunity to engage parents in a discussion about the many drawbacks of the SBAC test and it would empower parents by placing them in charge of whether or not their child should take the SBAC test. Most important, this course of action is most in keeping with the letter and spirit of the new ESSA federal law. The Iowa Assessment System was developed more than 70 years ago (in the 1930s), by teachers and child development specialists, before high stakes testing became a $10 billion per year industry and was taken over by Wall Street consultants out to make a quick buck. The Iowa Assessments have evolved numerous times with the most recent changes occurring in 2012 when the Iowa Assessment was aligned with the Common Core standards. Norm Referenced Assessments versus Criterion Referenced Assessments? Wall Street marketers claim that the Iowa Assessment system is not as useful a tool to measure "career and college readiness" as the tests they come up with because the Iowa Assessments are "norm-reference" tests measured against a national sample rather than the Wall Street tests, like SBAC that supposedly are "criterion-referenced" tests that claim to measure how a student performs against "college readiness" standards like the Common Core. The National Assessment of Educational Progress also claims that it is a Criterion Referenced Test. This is a misleading debate because both the SAT and the ACT are college readiness tests that are also norm referenced. Moreover, for more than 20 years, the Iowa Assessments, previously called the Iowa Test of Basic Skills or ITBS, has sought out and used learning standards from around the US to design and construct their test questions. The key thing that administrators and even Wall Street marketers use high stakes assessments for is to compare a state or school district to the national average. It therefore makes sense to use norming as a part of the benchmarking process. Otherwise, you wind up like with SBAC using completely arbitrary passing scores. Beginning in 2012, the Iowa Assessments aligned their tests to the Common Core Standards. In fact, currently, the Iowa Standards are more aligned to the Common Core Standards than the National Assessment of Educational Progress! Diagnostic or Formative versus Summative Assessments? Wall Street Marketers who push the SBAC test claim that the SBAC test can also be used as a formative pretest. That is because formative assessments are the new buzz word. There is no evidence to support the idea that a national test, that has nothing to do with the classroom or teacher in which the student exist can offer a valid and reliable formative assessment. Instead, formative assessments should be designed by the actual teacher for the actual students and the actual learning that the students will cover during their actual course. The Iowa Assessments have always been designed to compare the progress of a single student over a period of years compared to the average student who is at grade level. Thus, the stated goal of the Iowa Assessments is more in line with the new ESSA test (to determine whether a student is achieving at grade level) than any other test in the nation. The Iowa Assessment writers specifically caution against using the Assessment scores in isolation but rather than they should be used in combination with teacher observations and other student work (aka teacher grades). However, because the Iowa Assessments using a building block progression to learning and skill building, they can be used a Pretest. And because they are much shorter than the SBAC test, they can be given without disrupting a student's schedule. And they can be scored immediately. There are several subjects covered by the various Iowa Assessments. These include English, Reading, Writing, Math, Science and a couple other subjects. Unlike the SBAC tests which can take up to 9 hours or more than 4 hours for a single subject like English or Math, the Iowa Assessments are designed to be completed in a single class period. This key feature is important to avoid disrupting the schedule of the student or the schedule of the school. There is no taking the entire month of May off to perform SBAC testing. And as we noted above, they can be scored immediately! The Iowa Assessments report scores both in terms of percentiles (where a student stands in relation to the national average) and grade level (where the student stands in relation to being at grade level). This makes the Iowa test far better than the SBAC or other tests in complying with the provision of federal law to determine whether a student is achieving "at grade level" and what percentage of students are achieving at grade level in a given school, grade or school district. The Iowa Assessments make a great effort to select "appropriate vocabulary that children are likely to encounter and use in daily activities, both in and out of school." This is in sharp contrast to SBAC and other Wall Street designed tests that have been shown to use vocabulary and questions that are two to three grade levels about the grade level of the student taking the test. Again, the reliability was very high and the standard error of measurement was very low. This is an example of a highly reliable test with a low level of variability. some items below .3." The tables then confirmed that the level of difficulty of the K and First Grade tests was .7. Second Grade tests was .65. Third Grade on was set for .6. This fact is likely why the National Assessment of Educational Progress level of difficulty is set for .6 and why the GED test (prior to 2014) was also set for .6. 8th grade Iowa Assessment is partially predictive of HS GPA and College GPA. Computer versus Paper and Pencil Tests? Beginning in 2013, the Iowa Assessments come in both a computer and a paper version. There is a slight difference between the two tests because the computer version of the Iowa Assessments includes a few experimental "computer adaptive" questions. 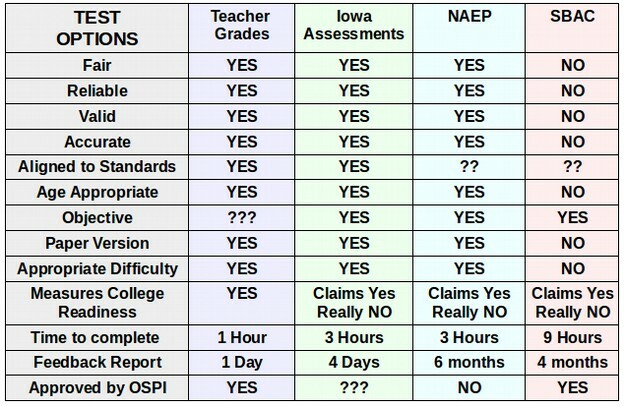 In 2014, researchers released the first comparative study of the paper versus the computer version of the Iowa Assessments. 3,600 students from 20 school districts were randomly assigned (1) paper-and-pencil (P&P) version first and online version second or (2) the online version first and P&P version second. Unfortunately only 10% of the sample was from high poverty school districts (which are the ones that will have the most difference between computer and paper tests so we cannot be entirely confident in the results of this study). Surprisingly, the correlations between the test versions was very high ranging from .7 to .9. The conclusion was that the online and paper tests yielded nearly identical results. 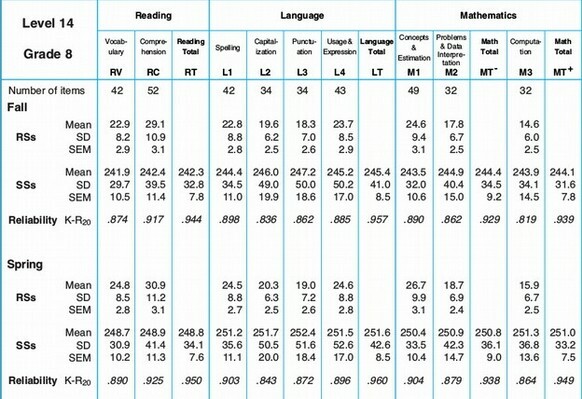 How can it be that the Iowa Assessments correlated while the ACE Aspire computer versus paper test versions did not? The authors of the test likely pre-screened the test questions and eliminated questions which were more difficult to complete on a computer than on paper. At the end of the study, they provide a detailed analysis of every question comparing the correlation of each question on the paper test to the identical question on the computer test. All of the questions had high reliability and low Standard Errors. This confirms that they made a deliberate effort to select questions that would permit comparison of paper to computer tests. This was likely done by eliminating any questions that required a high level of key boarding skill. We are therefore left with the conclusion that the Iowa Assessment paper test is comparable to the Iowa Assessment computer test. However, we would still urge caution in using the computer version of the Iowa Assessment for two reasons. First, the study did not include a representative sample of low income students. It is known that lower income students are less likely to possess computers at home and therefore are less likely to possess computer key boarding skills. Second, young children before the 6th grade are also likely to possess poor computer skills and poor key boarding skills. We would therefore recommend not using the computer version of the Iowa Assessment before students are in the 6th Grade. Finally, even though the Iowa Assessments have made a great effort to make their tests age appropriate, young children below the Fifth Grade often lack emotional regulation skills and may freeze during a high stakes test. We therefore recommend that high stakes tests not be given to students before the 5th Grade and that Teacher Grades, projects or other methods be used to determine whether younger students are at grade level. As noted earlier, the new ESSA requires that an assessment system have four essential characteristics. These are fairness, reliability, validity and the ability to accurately assess whether or not any given student is achieving "at grade level." In addition, we think it is important to also look at whether the test comes in a paper as well as a computer version and whether the test is age appropriate for younger students and whether the test questions have an appropriate level of difficulty for the average student. Given the current focus on "college readiness" we will also include whether there is any evidence that a particular test can predict college readiness. Finally, there is the legal question of whether an assessment system is already approved by OSPI and therefore can be used to meet federal reporting requirements under ESSA. We therefore present this Table as a means of comparing various test options. #1: Have their child take the SBAC test. #2: Have their child take the Iowa Assessments instead of the SBAC test. #3: Have their child opt out of both of the above assessments (reporting a Did Not Participate to the State and Federal Government). This course of action will not satisfy parents and teachers who want the SBAC test to end immediately. But it would give the school board an opportunity to engage parents in a discussion about the many drawbacks of the SBAC test and it would empower parents by placing them in charge of whether or not their child should take the SBAC test or some other option. Most important, this course of action is most in keeping with the letter and spirit of the new ESSA federal law. The federal reporting requirement under the new ESSA is the percentage of students who are performing at or above grade level. In this case, the term "proficient" does not mean passing some unreliable SBAC test but rather whether a student is performing at or above grade level. Compliance with federal reporting requirements is very easy with the Iowa Assessments because scores are reported in terms of whether a student is at grade level. Scoring could be done by the school district in a matter of days or by Iowa Assessments in a matter of weeks. Federal law also requires a plan for improvement. The plan could be as simple as advocating for more funding and lower class sizes so that the 24% of struggling students who are not currently at grade level can get the help they need to be brought up to grade level. At the same time, it is essential to put a process in place where this would be the final year of the SBAC test. The first step in this process is requesting approval from OSPI to use the Iowa Assessments instead of the SBAC test to meet federal reporting requirements. This request can use the summary of federal law and research in this report to form the basis of the request. It is also essential to allow for a public comment period as required by federal law to seek the input of all stakeholders including parents, teachers and administrators in developing the final request for transitioning from the state SBAC assessment system to the Iowa Assessment system. Hopefully once these essential steps were taken, the Superintendent of Public Instruction would honor the request of the school board and the Iowa Assessment system could fully replace the SBAC test assessment system in spring 2017. Equally important, according to federal law, once the state grants any school district the option to use an alternative assessment system, then every school district in the state would immediately have the option of choosing the same local assessment system. What would happen if the Superintendent of Public Instruction failed to grant the request to use a local alternative assessment system? Federal law seems to require the Superintendent to grant the request as long as it meets the minimum conditions of the federal law. However it is possible that the Superintendent would deny the request. If this were to happen, the school board might consider legal action to enforce federal law and protect students from harm. However, there is also a political solution. 2016 is an election year. The current superintendent has publicly stated that he is not running for re-election. Given that the SBAC test is strongly opposed by both major political parties in Washington state, candidates for the Superintendent office can be asked to publicly state whether they would support the school district request for more flexible local assessment options. The school board could then notify parents of the positions of the candidates on this issue. In reality, opposition is so strong to the SBAC test that it is highly likely that each candidate for State Superintendent would pledge to grant the request of the school district as their first action in office in January 2017. What about the claim that students who pass the SBAC test will be allowed to skip College level Math and English courses? Some parents might be tempted to have their students take the SBAC math test in order to allow their students to skip college level Math and English courses should they pass the SBAC math test. This is an extremely bad idea. Skipping lower level college Math courses will only increase the chances of a student failing upper level college math courses. Since there is no relationship between any bubble test and college readiness, parents should not risk the future of their students on an unreliable SBAC test. However, the Iowa Assessment system offers the same "college ready" scale as the SBAC test. If parents still want this option, they can have students take the Iowa Assessment assuming OSPI would accept it as an equivalent accomplishment. What about the threat of the legislature to deny a high school diploma to any student who fails to take and pass the SBAC test? As we have discussed earlier in this report, draconian and unfunded laws passed by the state legislature are contrary to the Washington state constitution. What is more important under the Washington state constitution is the position of the next Superintendent of Public Instruction on the question of whether students should have to pass an unfair high stakes test in order to graduate. It is likely that all candidates for the Superintendent of Public Instruction office will publicly announce that they are opposed to this draconian requirement. The State Constitution does grant the Superintendent of Public Instruction almost total control over public school policy and management. Therefore, a new Superintendent can simply waive the requirement in January 2017. It is time to allow students, parents, teachers and administrators to have an open and honest discussion about the future of high stakes assessments in the Seattle School District. The School Board can begin this discussion by sending out a letter to all parents explaining why this action is needed and the options available to parents. But this is only the beginning of the discussion. We want and need to hear from parents and teachers as to what additional steps and options are needed to comply with federal law while also protecting our students from the harm of excessive and unfair tests. Therefore, it is also important to set up a special online feedback form at the Seattle School District website where parents and teachers can contribute their thoughts, concerns and questions. There also needs to be community forums held at every school where parents, teachers and students can express their concerns. Ultimately each parent should be empowered to make an informed decision that is in the best interest of their child. We are convinced that the SBAC test is not a good solution for our students. The SBAC test may be the worst, most harmful high stakes test ever created. 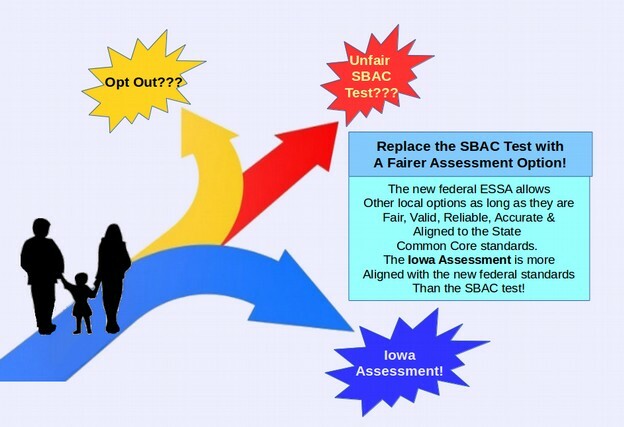 It is time to end the harm the SBAC test inflicts on students by replacing the SBAC assessment system with the Iowa Assessment system.But this is only a temporary solution. A more permanent solution should come after getting feedback from students, parents and teachers. As always, feel free to email or call me with your questions and comments. David Spring has a Bachelors Degree in Science Education from Washington State University and a Masters Degree in Child Development from the University of Washington. He has taught courses in Problem Solving and Conflict Resolution at Bellevue College for nearly 20 years. He is currently the Director of the Coalition to Protect our Public Schools and a leader of Opt Out Washington, a parents rights group and Restore GED Fairness which advocates for a fairer GED test. David has written extensively about the drawbacks of Common Core and the SBAC test including his recent book and website, Weapons of Mass Deception - The Billionaires Plan to take over our public schools - and how you can stop them. You can read his articles online at the following websites: coalitiontoprotectourpublicschools.org, optoutwashington.org, restoregedfairness.org and weaponsofmassdeception.org. Recently, the Washington Superintendent of Public Instruction (OSPI) released the Achievement Index for the 2014-2015 school year. This index uses test scores from the grossly unfair and unreliable SBAC test - a test that is so difficult that almost no one in the state legislature can pass it - to rank our kids and our schools. In this article, I will explain why this (de)grading system is harmful to students, teachers, schools and communities - which is why I will immediately end both the toxic SBAC test and the equally harmful Achievement Index if am elected Superintendent of Public Instruction. Garfield was given a Index Rating of 5.67 which is a "D" under the OSPI rating system. What is disgusting about this rating system is that it ignores the poverty in the school district and it ignores huge class sizes and lack of state funding. When compared to other urban high schools with high poverty and high class sizes, Garfield is one of the the highest achieving urban high schools in the nation in terms of the percentage of high school graduates and the percentage of students who go on to succeed in college and careers! But you would never know that from the disgustingly inaccurate rating system used by the Washington State Superintendent of Public Instruction. But the problems with this ranking system go far beyond the fact that it is not accurate. The real problem is that it places how students achieve on a grossly unfair bubble test called the SBAC test to rate kids, teachers, schools and entire communities. The SBAC test is a variable question test in which different students actually are asked completely different questions. Not only does it make it impossible to accurately compare one student to the next, but neither teachers or parents have any idea what questions were asked of their students or whether the question had any relationship to what the student was actually taught in their classroom. What we do know about the SBAC test is that the questions are often "age inappropriate" using language and skills that are often many grade levels about the grade level of the student. This is because the SBAC test is based on the "Common Core Standards" - standards which have been reviewed and rejected by hundreds of child development specialists from across the nation. For example, a question from the nation's most popular Common Core Second Grade Math book (meaning it could appear on the 3rd Grade SBAC test) asks students to determine the number of paper clips in a pile of paper clips when given three equations with three unknowns. Many members of the State legislature would be unable to answer this question. Yet 3rd Graders with no ability to engage in abstract reasoning are being forced to deal with questions that so impossible that they are in fact a form of child abuse. To add insult to injury, teachers and schools fear that parents and voters will judge the school based on student test scores on these ridiculous bubble tests. So the entire year is spent preparing students to take these grossly unfair tests - meaning subjects that the students are interested in, including art, music and history, are sacrificed to spend the entire year on drill and kill prepping for these toxic high stakes bubble tests. Even time for recess and lunch have been cut back to spend more time on test prep - destroying not only the child's interest in learning but destroying their physical well being. What our kids need is not more toxic tests but more teachers so we can lower class sizes so that struggling students get the help they need to succeed in school and succeed in life. Currently, our state legislature spends about $9 billion per year on education for one million students. This comes to $9,000 per year per student or about $4.50 per day per student. This is the lowest school funding in the nation which is why our kids are subjected to the highest class sizes in the nation. At the same time, our legislature gives away about $36 billion per year in tax breaks for wealthy multinational corporations. Put another way, for every dollar the legislature spends on our kids, it gives away $4 in corporate tax breaks. My plan is to double school funding by asking our Supreme Court to repeal about one third of the corporate tax breaks. This will allow us to build hundreds of urgently needed schools, hire tens of thousands of teachers, raise teacher pay 30 to 50% and cut class sizes in half. This will not harm these corporations as they can deduct their state taxes from their federal taxes. But it will make a huge difference for our kids, our teachers and our schools. 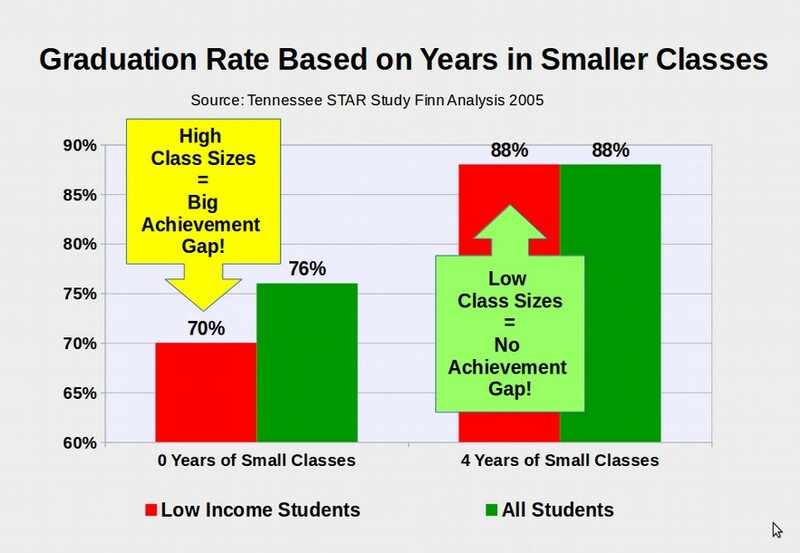 The largest experiment on the effect of small class sizes was conducted in the state of Tennessee more than 30 years ago. Called the STAR experiment, about 12,000 students in 80 schools were randomly assigned with 6,000 given small class sizes of 16 students and the other 6,000 given regular class sizes of 25 students in grades K through 3. 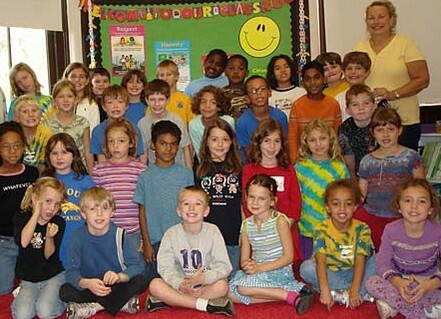 In the 4th grade, all students were returned to regular size classes. There was both an immediate benefit and a long term benefit to small class sizes. Students in smaller classes had fewer attendance problems, fewer discipline problems, and much higher test scores. The effect was most noticeable among lower income and minority students. In addition, lower class sizes reduces the teacher attrition rate. But the most important benefit was discovered 8 years later. Small class sizes increased student self confidence which led to a dramatically higher graduation rate and a dramatically lower drop out rate. Thisbenefit was also most noticeable among lower income and minority students The drop out rate 8 years later among low income students was cut from 30% to only 12%. Equally important, the so-called "achievement gap" or difference in achievement between students from higher income families and lower income families was completely eliminated by giving all students 4 years in small class sizes. This is why as Superintendent, I will use my authority under Article III, Section 22 of the Washington State Constitution to immediately end the unfair SBAC test and why I will use my authority under Article IX, Section 1 of the Washington State Constitution to immediately file a motion with our Supreme Court asking them to declare $12 billion of the $36 billion in tax breaks to be unconstitutional so that we can immediately start rising teacher pay, hiring more teachers and building more schools. We cannot solve the school funding problem by using inaccurate bubble tests to unfairly rate half of our schools and half of our kids as failures. We cannot solve the school funding problem by constantly re-electing the same corrupt people who created the problem. While everyone in the legislature and everyone running for State Superintendent claims that they are "advocates for school funding" the fact is that there was only one bill introduced in the legislature in the past 6 years that would actually provided the billions of dollars needed to significantly lower class sizes. This was Senate Bill 6093 - a bill that I wrote to repeal tax breaks for the rich. We as parents and voters need to look beyond what politicians say when they are running for office and look more closely at what they did or did not do while they were in office. The best predictor of future behavior is past behavior. It is a fact that I am the only candidate who has a real plan to restore school funding. I am also the only candidate who has pledged to end the toxic SBAC test and the grotesque Achievement Index during my first week in office. To end these toxic tests, I need your help. Please share this article with other parents and teachers. Go to our campaign website, Spring for Better Schools.org and make a donation to our campaign. Join our group of volunteers and start organizing parents and teachers in your community. Together we can restore sanity to our public schools and provide all of our students with the quality education they need and deserve to succeed in school and succeed in life. In this article, I will explain why I oppose toxic and unfair high stakes bubble tests such as the SBAC test and why I will end them a graduation requirement. I am the only candidate for State Superintendent who has a firm plan to end the high stakes tests as a graduation requirement in our state. The SBAC test is an unfair bubble test designed to label as failures more than half of the students who take the test. Yet two of my opponents (Reykdal and Seaquist) have voted to make the SBAC test a graduation requirement in Washington State! The makers of the SBAC test falsely claim that it can predict if students are "college ready." In fact, no bubble test has ever been able to predict if a student is college ready. 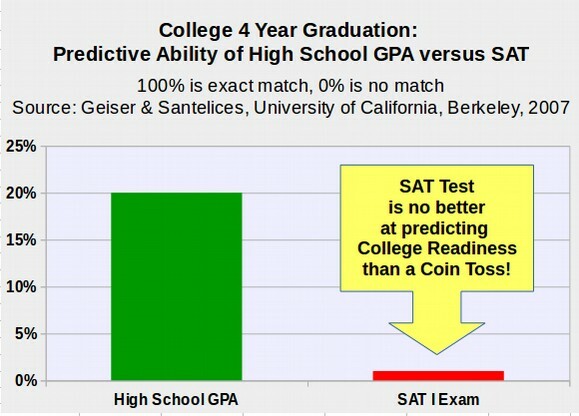 The only predictor of college readiness is a students high school GPA. In 2015, 62,000 parents in Washington opted their children out of the SBAC test - resulting in Washington having a "participation rate" of only 91%. At a Senate hearing on April 12 2016, Senator Lamar Alexander, one of the prime authors of the new ESSA scolded the Department of Education for continuing to threaten states with loss of federal funds and violating several key provisions of the new ESSA. Senator Alexander stated: "Your department proposed a rule that would do exactly what the law says it shall not do... Not only is what you are doing against the law, but they way you are doing it is against another provision of the law... If the department (of Education) tries to force states to follow regulations that violate the law, I'll tell them to take you to court." Sadly, on that same day, April 12, 2016, the Superintendent of Public Instruction violated the new ESSA by sending letters to about100 school districts in threatening them with a loss of federal funds unless they submit an enforcement plan. What this letter completely ignored, besides ignoring the new federal law, is that parents and students at many schools are completely against the SBAC test. In Seattle, at Nathan Hale High School, 99% of students opted out. At Garfield High School, 98% of students opted out. At Ballard High School, 97% of students opted out. At Ingraham High School, 95% of students opted out. It does not matter what kind of plan the Seattle School District comes up with. 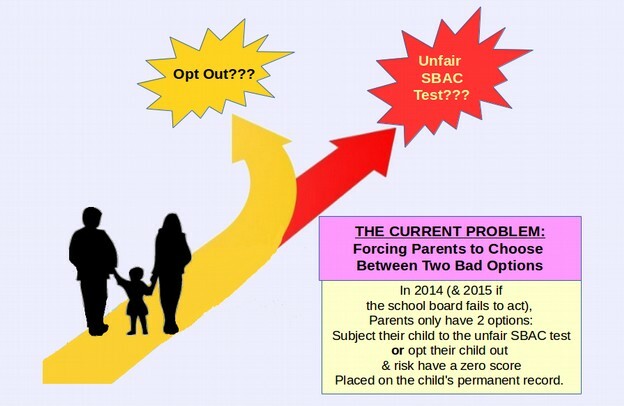 Parents and students are simply going to keep opting out because the problem is not the students who are opting out - the problem is that the SBAC test itself is unfair and harmful and parents know it. On April 24, 2016,Carolyn Leith, a leader of a Parents and Students Rights group, Parents Across America, sent an email to all six candidates for Superintendent of Public Instruction asking us to make a statement on this shocking threat by OSPI. She asked that our responses be limited to 500 words. However, this issue cannot be properly answered in only 500 words. I have therefore published this more detailed statement on our campaign website. By contrast, in June 2013, two other candidates, Larry Seaquist and Chris Reykdal, voted for House Bill 1450 - the bill that forced the unfair SBAC test on students here in Washington state. Since 2013, Chris Reykdal has been the main cheerleader for the SBAC test in Olympia. In 2015 and 2016, Reykdal sponsored House Bill 2214 - a bill to accelerate the transition to the SBAC test from the Class of 2019 to the Class of 2017. Reykdal claims that his bill "protects the rights of parents to opt their child out of the SBAC test." This is not true. In fact, Section 102 states that high school Juniors who opt out will be punished by having a zero score placed in their permanent record. They will also be required to take an additional course during their Senior year that is " at a higher course level than the student's most recent coursework in the content area in which the student received a passing grade of C or higher." So if a student completes Algebra 2 during their Junior year but either opts out of the SBAC math test or takes it and fails, they will be required to complete a Precalculus course during their Senior year in order to graduate. Reykdal's draconian bill would make Washington one of the only states in the nation that would punish opt out students by placing them at risk of not graduating from high school. As for what school districts should do to reduce the opt out rate, they should apply for a local option that is fair, valid, reliable and accurately measures whether students are achieving at grade level. There are only two assessment methods that have these essential characteristics. Those options are teacher grades and the Iowa Assessment. If school districts want to use the most accurate assessment method, then I recommend using Teacher Grades - for example by reporting the student grade in their math class to meet the math assessment requirement and reporting the student grade in their English class to meet the English assessment requirement. If a school district wants to use a bubble test that is fair, valid and reliable, then they can use the Iowa Assessment. This research indicates that because of a lack of computers in their homes, low income and minority students score about 10% to 20% lower on an online computer test than they score on an identical test that uses a paper and pencil format. A similar result occurred with two new Common Core High School Equivalency tests. The Pearson GED test is an online only test that only 30% of students can pass while the HiSET offers a paper and pencil version of their test that 60% of students can pass. Perhaps this is why, when low income struggling students are offered a choice between an online high stakes test and a paper and pencil high stakes test, over 80% choose the paper and pencil test. For example, New Hampshire offers the HiSET in both paper and online versions. In 2015, 85% of students chose to take the paper version of the HiSET test. 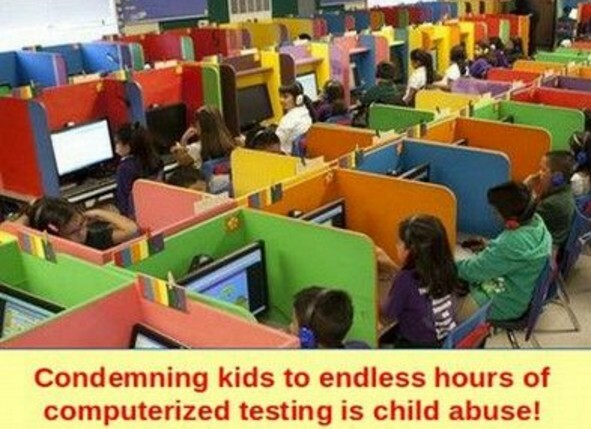 Therefore the fact that the SBAC test is only available in an online version is unfair to low income students who lack experience with computers in their home. The source of the problem is not federal law. It is that the Washington State Superintendent of Public Instruction has failed to comply with federal law by failing to provide the school district with an assessment system that is fair, reliable, valid and accurate. The good news is that the school district already has an assessment system that is fair, reliable, valid, accurate and nationally recognized in the form of teacher grades. The SBAC test harms low income and minority students by labeling nearly 75% of them - even students performing at grade level - as failures. These low income third graders, many of whom already face significant challenges in their home life, tend to internalize the failure to pass the SBAC test. They blame themselves for failing the test. They get depressed and give up on school and give up on life - falsely concluding that they are stupid because they cannot figure out how many boxes of paper clips there are and how many paper clips are in each box. Furthermore, because the SBAC test has been developed in secrecy, no school board members, teachers or parents are able to independently review the reliability, validity or fairness of any particular test questions or any particular test. This utter lack of reliability stands in sharp contrast to the National Assessment of Educational Progress (NAEP) that has published their test questions along with the actual percentage of students that have correctly answered each test question. For example, the following table shows the actual percentage of students in the United States who got the correct answer on an algebra question about determining height from a formula was 42%. This question was therefore rated as a NAEP "medium" difficulty math question. You can see from the above table that NAEP Hard Math questions can be answered by A and B students while NAEP Medium Math questions can be answered by C students. Also, the NAEP ranking system made a controversial change to the traditional grading system. NAEP changed a D grade which has historically been a passing grade into a failing grade. This meant that to pass the NAEP test, with a score of Basic, a student needed to be “at grade level” with an average traditional grade of C. This change tripled the percent of students who were labeled as failures from 10% to 30% - without any change in the actual performance of the students. The SBAC test went even further than the NAEP test. SBAC test designers had the audacity to even declare students who are at grade level and passing with a C grade as failures (SBAC level 2). This increased the percent of students who were labeled as failures from 30% to 70%. 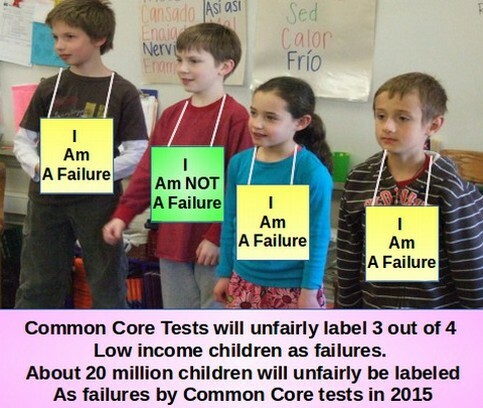 This is the reason the SBAC test fails two out of three students who take the test – it is designed to fail even students who are at grade level! This was done by manipulating the cut scores of the test. While both the Iowa Assessment and the NAEP test estimate that about 78% of Seattle School District students are at grade level, the SBAC test falsely claims that only 56% of Seattle School District students are at grade level. This confirms that the "standard" being measured by SBAC is not the same as the "at grade level" standard being measured by the NAEP math test and being measured by the Iowa Assessment. This is why the SBAC test is not a fair, reliable, valid or accurate assessment. The failure of the SBAC test to accurately measure the actual ability level of Seattle School District students can only partially be attributed to the misuse of the term "proficient." The fact that SBAC is a computer only test and that it gives different test questions to different students are also likely contributing factors to the unfair nature of the SBAC test. The following chart shows that the 11th grade SBAC math test is even less accurate in determining the percent of students at grade level than the 8th grade SBAC test. The Iowa Assessment was developed more than 70 years ago (in the 1930s), by teachers and child development specialists, before high stakes testing became a $10 billion per year industry and was taken over by Wall Street consultants out to make a quick buck. The Iowa Assessments have evolved numerous times with the most recent changes occurring in 2012 when the Iowa Assessment was aligned with the Common Core standards. Wall Street marketers claim that the Iowa Assessment system is not as useful a tool to measure "college readiness" as the tests they come up with because the Iowa Assessments are "norm-reference" tests measured against a national sample rather than the Wall Street tests, like SBAC that supposedly are "criterion-referenced" tests that claim to measure how a student performs against "college readiness" standards like the Common Core. The National Assessment of Educational Progress also claims that it is a Criterion Referenced Test. This is a misleading debate because both the SAT and the ACT are college readiness tests that are also norm referenced. Moreover, for more than 20 years, the Iowa Assessment has sought out and used learning standards from around the US to design and construct their test questions. The key thing that administrators and even Wall Street marketers use high stakes assessments for is to compare a state or school district to the national average. It therefore makes sense to use norming as a part of the benchmarking process. Otherwise, you wind up like with SBAC using completely arbitrary passing scores. Beginning in 2012, the Iowa Assessments aligned their tests to the Common Core Standards. In fact, currently, the Iowa Standards are more aligned to the Common Core Standards than the National Assessment of Educational Progress! The Iowa Math Assessment tests a broader range of skills than the NAEP math test. In addition, the Iowa Assessments now include a "college ready" score in addition to their "grade level" score based on an alignment study with the NAEP test. The Iowa Assessments report scores both in terms of percentiles (where a student stands in relation to the national average) and grade level (where the student stands in relation to being at grade level). This makes the Iowa test far better than the SBAC in complying with federal law to determine whether a student is achieving "at grade level" and what percentage of students are achieving at grade level in a given school, grade or school district. Are You As Smart as a Common Core Second Grader? Here is an example of the kind of ridiculous test questions this Third Grader was expected to answer. (note that this question was taken from the nation's most popular Second Grade Common Core Math Book, called Math Expressions). According to the publisher, Houghton Mifflin Harcourt, "Math Expressions Common Core focuses on the priority core concepts at each grade level, identified by the Common Core State Standards, to build in-depth understanding of major mathematical ideas." "Brian has some boxes of paper clips. Some boxes hold 10 clips and some boxes hold 100. He has some paper clips left over. He has three more boxes with 100 paper clips than he has boxes with 10 paper clips. He has two fewer paper clips left over than he has numbers of boxes with 100 paper clips. What number of paper clips could he have?" Remember that Second Graders are small children. See class below. The Paper Clip question requires several levels of abstract reasoning. First, the child must imagine an unknown number of boxes that have ten paper clips in them. This number could be any number between one and one million (even though many Second Graders have no experience with numbers greater than 100). We will call this abstract number Z. Second, the child has to also imagine an unknown number of boxes that have 100 paper clips in them. This number also can be between one and one million. We will call this abstract number Y. Third, the child has to imagine an unknown number of loose paper clips that are not in either any of the boxes of ten paper clips or the boxes of 100 paper clips. The number of loose paper clips can also be any number between one and one million. We will call this abstract number X.
X (the loose paper clips) = Y (the number boxes of 100 paper clips) minus two. Another equation is Y (the number of boxes of 100 paper clips) = Z (the number of boxes with 10 paper clips) plus 3. Each of these steps requires abstract reasoning far beyond the ability of most Second Graders and in fact, beyond the ability of most adults and most state legislators!Even knowing all of these clues, which a small child is not likely to understand, most adults and most state legislators still could not solve this problem. Have you figured it out yet? Do not feel bad if you have trouble answering this math puzzle. We have given this problem to state legislators who were unable to solve it. The fact that state legislators are requiring Second Graders to solve math puzzles that legislators themselves cannot solve is an indication of how inappropriate the Common Core tests are for very young children. The authors of Common Core, and the SBAC test are apparently not aware that Second Graders and Third Graders are still in the concrete thinking stage of brain development and are not capable of abstract reasoning.Children are not capable of Abstract Reasoning until about the Sixth to Eight Grade. So this question is at least four to six years beyond the brain development of a Second Grader. The new ESSA states on page 24 that its purpose is to determine "whether the student is performing at grade level." Because the SBAC test does not provide accurate information about whether a student is achieving at grade level, the SBAC testdoes not comply with the ESSA. As superintendent, I will therefore end the SBAC test not just as a graduation requirement but completely in all grades - and replace it with assessment optionssuch as Teacher Grades and/or the Iowa Assessment that do accuratelymeasure whether a student is achieving at grade level. As always, we look forward to your questions and comments!